Will Hall ever finish another successful marathon? We might never know why Ryan Hall decided to drop out of the LA marathon. Will he ever finish another marathon? Will he ever come close to his American Record? The last few years, Ryan has been under attack by almost everyone. Since he performance of 2:04.58 in Boston, he has dropped out of several races, or finished disappointed. He hasn’t had a great distance race (for him, it’s all relative) since his performance at Boston. 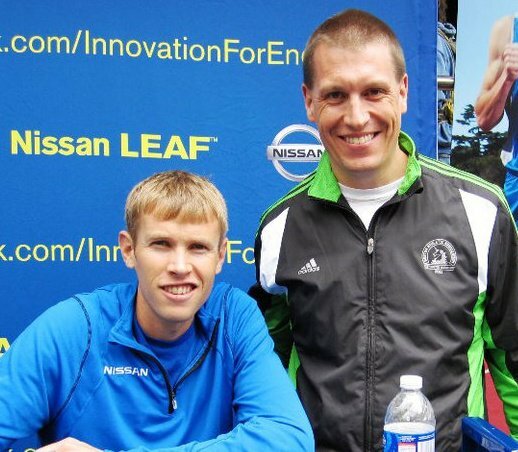 To preface this post, Ryan Hall is one of my favorite elite runners. I also am not (or never will be) an athlete of that caliber. I don’t rely on running as a source of income and I’m grateful for that. It would be a very hard job, career and I applaud elite runners who make it work. For the majority of racers, we don’t rely on running for paychecks. If we have a bad race we complain for a while then move on. We don’t worry our sponsors will drop us or that we will be on a strict budget (due to lack of income) for a while. We have a bad race and move on. Was it smart of him to drop out of this marathon? Should he have just “gutted it out”? Possibly finishing above 2:20 or even 2:30? In 2012, he DNFed at the London Olympics. In 2013, he ran no marathons. He was scheduled to run both Boston and NYCM. In 2014, he ran a 2:17 at Boston and placed 20th. In 2015, he DNFed the LA marathon. For elite athlete distance runners, it is often smarter to withdraw from a race early. This allows the body to recover faster and prepare for another marathon sooner. When an elite athlete knows they are extremely off pace, they withdraw…recover and begin preparing for a race sooner. I think this is wise and tactical. Why finish a race they know is not going to get them where they need too? They can recover and live to race another day…sooner. My question is Ryan has not done this. He dropped out of one race and doesn’t start another. He hasn’t saved himself for another great race because he hasn’t run another one. Another point to consider is that it was hot at the LA marathon. When you prepare for a race, train well, appropriately taper and do everything right training wise…it stinks to have the weather not cooperate. Am I saying this is the reason he dropped out? No…lots of runners finished the race that day…including his wife. In my nonelite opinion, Hall needs to take more time and get back to shorter distances. Like a newer runner just work on shorter races for a while before getting back into the marathon. Ryan Hall said “You can only have one best day of your life”…maybe he has peaked at Boston a few years ago and we are all having a hard time accepting this. Question for you: What do you think about Hall? The 2:04 might have been the peak of his marathon career, but isn’t he better at the half marathon? That might be a place for him to hang out for a while, maybe he has some mental block about the marathon, and in the meantime, he could race MANY half marathons and pull in some serious cash. Unfortunately, pro runners usually make more money in sponsorships/endorsements than prize money, and half marathoners aren’t as marketable as marathoners in the U.S., for some reason. Plus there is no half marathon in the Olympics, nor are most half marathons nearly as high-profile as big races. So while this may help him make more prize money, it might not be best for his career overall. Like you said, things like this make me so happy that I just race for fun/personal goals and not for my job. When I have a bad race (almost 3 minutes off a 10k PR in an ice storm OMFG why can’t I forget), I just leave and get back to the rest of my life and my job. If I were depending on that for money, youch. Yeaa. I think he just needs to get back to his basics. I’ve seen him be quoted saying “I’m not afraid of failure” but with all these DNF, it sure sounds like it he is.. I like the guy. But it’s really disappointing that someone who’s that popular and well known can keep doing that, there’s fans, teammates, even organizations that are counting on him to race. I like what you said though.. I totally agree. And I’m no pro obviously, but hopefully he’ll figure it out. I always think it’s interesting to see fans speculate about and judge elite runners. I’m very grateful that if I ever DNF, it’s not going to make a public splash. You have no idea why he dropped out- even if he came out and said something specific about it, there are so many factors that go into that hugely disappointing decision. I feel like a DNF is such a personal choice, it’s so heartbreaking to put in the time and the training to drop out like that (whatever the reason), and it really makes me upset that people are speculating and judging him all over social media. I understand that he’s a professional runner and that he signed up for that kind of attention, but it just feels like kicking someone when they’re down. I’ve had a few DNFs and I agree with you Emily. It’s such a personal choice. I am a Ryan Hall fan. I wish him the best in his career but I do wonder if a different method of training would be more beneficial. As you said, it does make me grateful to not live the life of an athlete runner. Even if he never has another successful marathon, that will never take away from his accomplishments in my eyes. I look at it this way, if he had retired at the first signs of going down hill, we would have all praised him for having a great career. Instead he decided to stick it out longer and go for it. I would never fault anyone for that. No, I’m not excited to see DNFs, but I will give him the benefit of the doubt that they were the best move at that time. Well, I am in the very big minority in thinking that he has more in him to give! I’m not writing him off yet. Sometimes elites (and mortals) go through really crappy periods that can last even a few years. With L.A., I give him a pass. Marathoning in that heat isn’t going to get anyone a decent time and if it meant saving himself for a future race, then I think it’s worth it. I guess time will tell! I think it’s awesome that he’s sticking it out even if he peaked at Boston. Growing up as a national level swimmer I have a VERY hard time still doing any sports cause I’m not GREAT at anything anymore-it’s certainly humbling. On a different note, I did get to meet him at the 2012 Nashville Marathon and he’s a quiet dude! But thank god my times aren’t broadcasted like this. He ran a marathon faster than I ran a half. Oh boy! Here’s the thing about Hall, I don’t think he’s a good marathon runner. Yes, he holds the American record, but at what point to you step back and realize that maybe it was a fluke? He has shown no other indication that he’s actually that caliber of a marathoner. I’ll take a consistently solid career over one amazing achievement bookended by mediocrity. I’m with you Amelia, I think he is much better at a lot of other distances. I still hope for the best for him, but my hopes aren’t too high at this point. This is why it is awesome to run for fun and not be an elite (and yes, you can train, care about your time, and pursue PRs and still be “running for fun”- if you are not running for a paycheck then you are running for fun and enjoyment). I understand 100% why an elite would drop out of a race to save themselves for another one. It’s one thing for a mere mortal to “gut it out” but as an elite, seems like it’s one of those d***ed if you do, d***ed if you don’t situations. They have a bad time, deal with the backlash. DNF, deal with the backlash. In the end, Ryan Hall knows his running and body better than any coach or spectator or other runner… after all he has to live in that body and was running in this race and had to make that difficult decision to drop out. Ryan Hall is still an amazing runner. Even his times that aren’t great (for an elite) are still pretty awesome. Maybe he has run the fastest marathon of his career and should focus on another distance, or go into coaching, etc. Ha ha ha ha… I’m sorry, but it’s so funny when I hear people say he’s not a good marathon runner when he clocked one at just over 2 freaking hours!!! Bodies are strange things. Maybe he peaked, maybe he didn’t. Maybe he’s got some emotional stuff going on that affects his physical, maybe he had a bum rash, maybe maybe maybe. Who knows? Maybe he’s got another beastly run in him and maybe not. Either or, he’s got my respect. I’m not sure how I feel about him. I have mad respect for him, clearly he’s trained hard and is quite fast. However, I agree with those that are frustrated at how many DNF’s he has, especially when he talks about redeeming himself. I’ve been blessed to never have a DNF, but I would hope that the only reason I would have one is to avoid injury. All that being said, the man is only human and I hope for the best for him…whatever that looks like. My husband and I were just talking about this exact thing after watching the LA Marathon. Since my husband just started following elite running back in the fall, he doesn’t think Hall’s a good runner because of Hall’s recent performances. Ryan and Sara Hall are two of my favorite elite runners, but he just has not had good luck in racing over the past few years. At this point I wonder if he’ll even in on the 2016 Olympic team. But I do think that he will have a comeback – other elites like Kara Goucher go through slow (for them) or no-racing periods and then build back up to the top. I was a HUGE Ryan Hall fan, then he dropped out of NYC and Boston and DNF’d in LA. Of course, being in the public eye means there’s a lot of judgement and questioning of all of his decisions, but if he’s struggling this much to complete a marathon, I agree he should look at different distances. If I recall, he doesn’t currently have a coach, maybe he needs to realize he needs one. His wife debuted in LA and didn’t have the best finish (based upon expectations). Of course the heat played into it, but maybe it’s best for him to rely on someone else instead of his own knowledge. I got to meet Ryan Leaf in May 2011 at the BolderBoulder. He’s a great guy, and had a lot of encouraging, thoughtful things to say to a guy like me that was brand new to the marathon world at the time. It’s easy to play armchair running coach, but it seems like his “struggles” began prior to deciding to coach himself and have persisted ever since. But only Ryan knows all the details, and he really is the only one that has legitimate right to be critical. My guess is that he has already run his best race. Maybe we all have. So what? For me, my best days haven’t necessarily been defined by a time. I don’t think that’s why we lace ’em up, and I think it is testament to the sport that we continue to try, even if we think our best days might be behind us. I like Ryan and all he stands for. It seems as though there’s some deeply personal issues he’s facing….maybe? We all know running isn’t just physical. It’s hugely mental. I would like to see him make a comeback…but life sometimes just turns us around to other ambitions. I think getting back to the basics would rekindle a love for the sport again. I agree with you. Maybe he should pray for a redemption marathon with the most perfect conditions. So, he is 32. Far from being “done”. He has plenty of useful years left in his legs. The real issue seems to be consistency either from an injury that he can’t shake or terrible training practices (which I do think are part of the issue). I’m like you though, I hope that he isn’t. I’m pulling for him. That’s a good point. I think it’s unfair to say that he is “too old” to ever run another PR marathon. Like you, it’s becoming more clear that something needs to change for him. He’s one of my favorite runners also. For people who run at this level, dropping out when something hurts or the conditions are poor is probably a good idea. I wish he would win more often though. As a back of the pack, charity number guy, the bad conditions just add to the experience. So a hot day may add 20 minutes to my race. No one will ever notice. So what. I would only drop out of a race if I were physically unable to continue. But I don’t have sponsors or a reputation to protect. I personally have had several “best days of my life.” I hope he changes his mindset. I think Ryan still has time to be the best marathoner of our time. He’s young, he’s capable and he’s still figuring it all out. I think were all forgetting what distance Ryan likes to race. Maybe he could get more money racing shorter races, but he likes the marathon so he will do it until he decides it is unfulfilling. He may be elite, but he’s still a person just like all of us. Ugh- this post breaks my heart. My brother said the exact same thing, he needs to drop to the half. Thug with him though is I doubt he ever will give up the marathon. I used to be a big fan of Ryan Hall…until I read his book and was really put off by his way of thinking. It definitely seems that he needs to get his mind in the right place, probably more than improving the physical aspects of running. Maybe his first few marathons were those rare ‘perfect’ runs that most seldom see and anything less feels like a lost cause to him. (Where most of us have had to push through the tough times to make progress and do well for ourselves). He has an amazing talent, and if he continues to run marathons, he’ll need to figure himself out…otherwise, he’d be much better off in shorter races. I’m kind of the same way. I hope he is able to find out what works for him the best.